One Monday morning in September 2008, I got to my desk in Parliament House, turned on my computer and began my morning, as i usually did, by reading the news on various websites. This particular morning, however, had a pall cast over it. I read that David Foster Wallace, one of my favourite writers, had died the previous Friday evening. After a decades-long struggle (or series of struggles) with depression, with his medication no longer working, he hanged himself. Reading this, I felt as if I'd been punched in the stomach. Not only had Wallace been one of my favourite writers of novels, stories and non-fiction, his style encourages feelings of intimacy. Without ever having met him, I felt like I knew more about his mind than I do about those of people I've known for years. (A slightly haunting coincidence is that on that same Friday afternoon, Eastern Australia time, I was listening to him read one of his essays on audiobook as I travelled to Sydney from Canberra.) This was not an uncommon reaction, I was to learn as I read comments around the internet over the next few days and weeks. Wallace's second novel, and most famous book, Infinite Jest, was published in 1996. Since then, he had released two books of short stories, two collections of essays and non-fiction, and a book on mathematics. His third novel, parts of which had been excerpted over the previous few years in various journals and magazines, was approaching completion at the time of his death. It has now been released, under the care of his long-time editor, in conjunction with his wife and his agent, as The Pale King. Like Infinite Jest, The Pale King revolves around multiple characters, but the effect here, despite the clearly unfinished nature of the novel, is in fact less fragmentary than is Infinite Jest. All of The Pale King's characters work for the IRS, at the Peoria, Illinois Regional Examination Center. The first few chapters will likely throw many readers off, as we are introduced to some of the cast as they are traveling to the Center, some as children, some as young adults. At this point, none are connected in any way we can see. Some chapters are short, some are long. They are written in noticeably different styles, and the idea of there being a main character is thoroughly dismissed. 70-something pages in, we get an Author's Foreword, written by The Pale King's putative author, one David Foster Wallace, ex-IRS employee. There's no way to hide that The Pale King is an unfinished novel (even by Wallace's standards - Infinite Jest famously ends on a moderately ambiguous note, some 1100 pages after it began, and his debut novel, The Broom of the System, actually ends mid-sentence). Yet the fragmentary, non-linear and distinctly plot-light The Pale King is nonetheless a satisfying read. Even had he finished it, Wallace would almost certainly have not tied together the various mini-stories or character (semi-) arcs anyway: it's really best seen as a collection of character pieces and interconnected short stories. It's also, as I am contractually obliged to mention in this review, as every other review has/will, a novel about the boredom and mundanity of working life, and the toll that can have on a person. Wallace was very specific that this book would not culminate in a big action set-piece: as one of his notes (included at the back of the book) indicates, he wanted to make The Pale King about: "Realism, monotony. Plot a series of set-ups for stuff happening, but nothing actually happens". As mentioned above, the different styles of different chapters allows Wallace to unleash the greatest weapon he has in his pretty formidable collection of writing skills: his peerless talent as a writer of monologues (or occasionally dialogues) (see: the Brief Interviews With Hideous Men series from the story collection of the same name, or Oblivion's title story). Many of the chapters consist of various characters monologuing for various reasons (interviews for a documentary, lengthy Friday-night-at-the-pub life story tellings). Many of these are hilarious, revealing or otherwise entertaining. 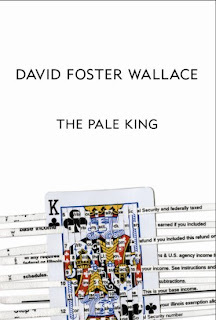 Indeed, I cannot stress enough just how enjoyable The Pale King is, containing as it does long stretches of David Foster Wallace at the top of his game. And David Foster Wallace at the top of his game is a pleasure matched by few other authors in my reading life. I guess the final question is whether 'new' readers of Wallace will find The Pale King enjoyable. It's actually a difficult question: as I've noted, it's a remarkably accessible book (with the proviso that if you value plot above all else, you'll find little here to sink your teeth into), yet at the same time I feel strange recommending it to Wallace neophytes. The two collections of non-fiction are probably the best place to start, but I would also recommend his last book of short stories, Oblivion, as being the best taster for his fiction style, which in general is much more formally difficult than are his essays. It's also a good representation of his style in The Pale King - no surprise, since they at least somewhat overlapped temporally. 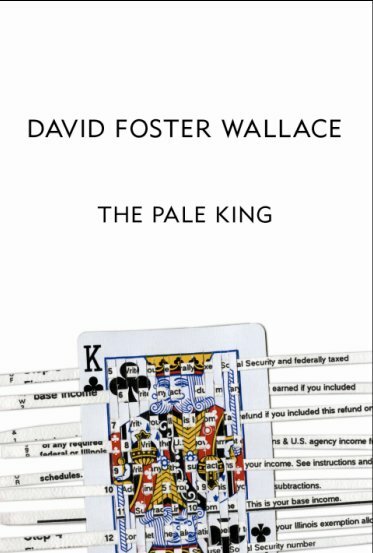 It is, of course, a tragedy on multiple levels that The Pale King will be the last novel we can read from David Foster Wallace. But for me at least, that feeling is countered by the great joy I felt in reading it. The world is a tiny bit sadder for no longer having David Foster Wallace in it, but it is also a little bit better for having The Pale King. ooh great, thanks for the excellent review. i am keen to read this, but almost dreading it as well. i feel it is really close to home too (I guess that is his genius). The preciousness of the commodity that is concentration is a really interesting theme. I feel it is the most valuable work tool I have (and you as an academic would as well), and is all too often under siege, especially since the internet. Also I'm looking forward to the IRS setting given my fondness for tax law. The setting reminds me of the Will Ferrell movie (although it wasn't a typical WF movie, was really sweet and thought-provoking) 'Stranger than Fiction', he is an everyman IRS employee having an existential crisis. Tax is supposed to epitomise boringness, but actually it is quite interesting! Anyway, think I'll try to get TPK tomorrow (it has been released, right?) and take it to the easter beach house! I hope it goes without saying, Chloe, that I look forward to you reviewing it sometime (if you feel so inclined). Either way, hope you enjoy it as much as I did!